Home Tags Posts tagged with "tomatoes"
In most people’s consciousness, Eastern Europe does not evoke delicious seafood dishes. Apart from caviar or smoked fish (which most people actually eat rarely), the images that come to mind tend to be of thick brown meat stews and starchy dishes, or perhaps of various grilled meats and greasy sausages, washed down with a profusion of beer and other alcoholic beverages. And yet, if you look further south, there’s another Eastern Europe altogether, one that borders the Adriatic on one side and the Black Sea on the other. Take Croatia, for example, which claims the largest share of the eastern Adriatic coast — just look at a map, and you’ll see that nearly half of the country is seaside, including the Dalmatian Coast with its vast number of small islands. People there have access to the same fish as Italy just across the way, and in some cases, they even make the same dishes! And that’s what happens with brodet, called brodetto in Italian. Despite regional variations in both countries, it remains a stew prepared with assorted local fish and shellfish, tomato, and garlic, cooked in a single pot without stirring. In Croatia, it’s often served with polenta to soak up some of the fish broth. Want to see how it’s made? Check out this video, from Australia of all places. It all starts with the seafood, of course. I’m using some of my favorite fish, conveniently available both from the Adriatic and from my online grocery store: turbot, for its great taste and texture, and monkfish, one of the few fishes that work great in stews. These may not be the most frequent species you’ll see at the Croatian markets, but they’re there. In the shellfish department, my beautiful extra-colossal shrimp (I know, it’s a ridiculous name, but that’s the official term) bring flavor to the broth and pair perfectly with the tomato and garlic. If you think there needs to be more variety, consider adding a few mussels too; I’m happy with few ingredients, well distinguishable, but I admit one would have to be seriously impaired to mistake a mussel for a piece of fish, either in appearance or taste. Speaking of the shrimp, it’s important to use whole, head-on shrimp, as the heads bring a lot of flavor. Peeling a shrimp while leaving the head on can be a bit tricky, not because it requires a special technique that I know of, but because the head becomes quite loose. It might still be worth the effort, as it makes the meal significantly less messy for your diners (the shrimp in my pictures aren’t peeled). If you do peel them, you can also use the shells to flavor the brodet. For example: sauté the shells in a little bit of olive oil, add the vegetable stock from the recipe (adding extra to factor in evaporation), cover, simmer for 30 minutes, then strain. I’m keeping the traditional polenta, but using a variation of the recipe that I already blogged about here. Once you’ve tried it, it’s hard to go back to anything else. Shouldn’t polenta, which is cornmeal, always taste like corn? Granted, it may not absorb a lot of the broth, but that’s what spoons are for. One last trick… This is the detail that’s gonna have the brodet purists turning in their graves: my turbot is deep-fried. This isn’t just a nod to Heston Blumenthal’s fish and chips from In Search of Perfection; it also brings more textures to the dish, and prevents the turbot from being lost among the other flavors by protecting it with a shell of a crispy, boozy batter made with hard cider and vodka. Because seafood can be consumed with a profusion of alcoholic beverages, just like any other Eastern European dish. Char the red pepper using a blow torch, then peel off the skin, using a paper towel to rub off the stubborn bits. Remove and discard the core and seeds, and cut into a brunoise. Measure 140 g and reserve. Melt the butter in a small saucepan over medium heat. Add the polenta, and toast for 4 minutes until golden brown, stirring constantly. Transfer the polenta to three one-pint Mason jars (about 500 ml each). Cover with the corn juice and water, and mix with a fork. Tightly close the jars, then reopen the lids by just a quarter of a turn. Place the jars on a steam rack in a pressure cooker with about 1 cm of water. Close the cooker, bring to pressure, and cook for 12 minutes. Depressurize the pressure cooker, and open the lid to release the steam. Reserve in a warm place. Before serving, transfer the polenta to a bowl, mix in the red pepper brunoise, and season with salt and pepper. In a blender, pulse half of the olive oil with the lemon juice, parsley, salt, black pepper, and sweet paprika. Transfer to a bowl, and toss the monkfish and shrimp in the marinade. Cover with plastic wrap, and refrigerate for 1 hour. In a pot over medium heat, sauté the onion and garlic in the rest of the olive oil for about 10 minutes, until soft. Add the white wine, and simmer for a few minutes, until reduced to about 1/4. Add the (peeled!) canned tomatoes with their liquid and the vegetable stock. Bring to boil, and simmer for 10 minutes without stirring. Add the monkfish, and simmer for another 15 minutes. Don’t stir — a brodet is never stirred. Instead, shake the pot, which will help to distribute heat while still preserving the layers. This is also a good place to pause until you’re ready to assemble the dish. Before serving, add the shrimp, the cherry tomatoes, and any remaining liquid from the marinade. Turn the heat up to high (to emulsify the sauce), and cook for 5 minutes, without covering. Serve immediately. In the bowl of an electric mixer fit with the paddle attachment, mix the flour, baking powder, honey, and vodka on medium speed. Add the hard cider and mix again. Transfer to a 1 liter siphon, and charge with three cartridges of C2O (the soda ones, not the ones you use for whipped cream). Refrigerate for at least 30 minutes. Heat the canola oil to 220 C / 425 F in a deep fryer (or a large pot). Cut the turbot into 6 pieces. Season with salt and pepper, then sprinkle with Wondra flour on both sides. Shake the siphon. In a bowl, release just enough batter to coat one piece of fish. Dip the fish in the batter until fully coated, and gently drop into the frying oil. Repeat with the remaining pieces of fish. When the turbot is golden brown on all sides (which requires flipping it, of course), remove from the oil using a skimmer, and drain on paper towels. The turbot’s internal temperature should be around 40 C / 105 F when you take it out, and it will go up to 45 C / 115 F.
Finish the brodet as explained above. Finish the polenta as explained above. Divide the polenta between six soup bowls. Top each bowl with two shrimp, some monkfish, and a piece of turbot. Add the liquid from the brodet, and sprinkle with chopped parsley. Serve immediately. Anyway, I’m not alone, and I’ve found some useful, practical, and affordable tips from some bloggers like Pinch of Yum. So I recently acquired a Lowel Ego Digital Imaging Fluorescent Light and a piece of wood modestly called “Naturally Distressed Recycled Rustic Weathered Boards” on Etsy. To celebrate, I decided to do what a certain category of food blogs (usually the ones that swear only by natural light) seems to revel in ad nauseum: a pedestrian recipe with totally superfluous pretty pictures. Well, not quite pedestrian. Even though you’ll find a few recipes elsewhere, tomato jus isn’t as hackneyed as cupcakes or cinnamon rolls yet. I’ve actually already blogged about it in my Russian pork shashlyk post, and I plan to use it some more. This version is extremely simple — no herbs, no garlic — but it tastes really good, partly because the jus isn’t mixed with stock or any other liquid. Does the world need another picture of tomatoes on wooden planks? Of course it does! I’ve been using natural wood for grilling shashlyks and other kebabs for quite a while now (I explained the process in my lyulya-kebab recipe post). 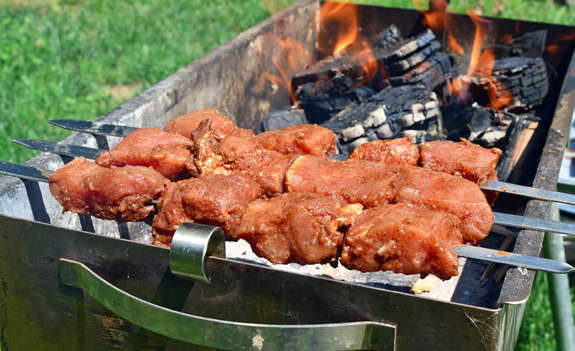 The wood smoke certainly imparts some flavor, but the relatively short cooking time of a kebab means that the exposure, especially on an open grill, isn’t sufficient to achieve the same results as, say, traditional American barbecue. While I don’t want to turn my meat into something that only smells like smoke, I’ve been searching for some middle ground. Looking at other smoked products, there’s one prominent example where tradition turned to a different combustible, more for reasons of availability than flavor in the beginning: Scotch whisky. You might not think of Scotch as a smoked product, and yet… Historically, peat was used in places where it was the only consistent source of fuel, such as Islay. The peat smoke would permeate the malted barley drying in the kilns, and the flavor of the whiskies produced owed so much to that smoke that distilleries retained the practice even after technology rendered it no longer necessary. The aroma of burning peat is so intense in fact that it’s called peat-reek. You can read more about the influence of peat on whisky here. This is all well and good, but this is a Russian food blog, not a Scottish food blog. But wait — aren’t there other parts of the world that have peat? I’ve previously posted a pepper dolma recipe from Azerbaijan, but today’s dish hails from Uzbekistan and is prepared fairly differently. Shurpa means soup or broth in Uzbek, and the stuffed vegetables here are served in a flavorful broth. 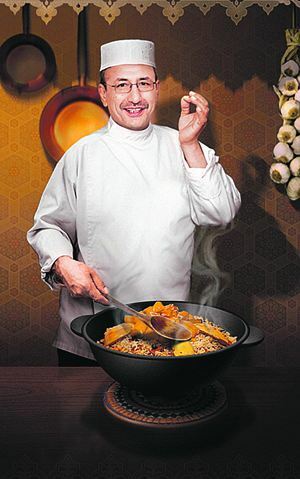 My recipe is loosely adapted from Hakim Ganiev‘s Oriental Feast, but I’ve made many changes, such as the use of my beloved pressure cooker. While working on a few kebab recipes over the summer, I’ve been facing a dilemma with my side dishes. On the one hand: tomatoes, peppers, eggplants, and zucchinis are the best things you can buy at farmers markets at the moment. On the other: I can’t serve all my shashlyks with grilled vegetables. 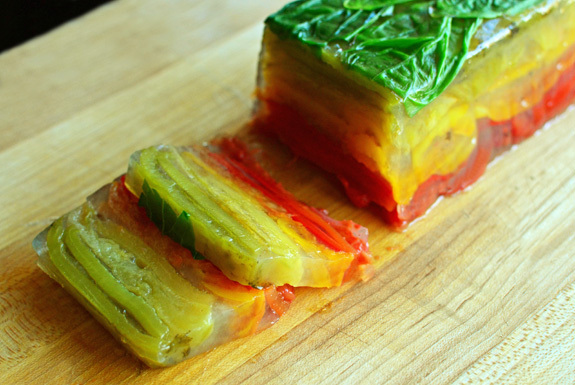 This terrine manages to still use the summer vegetables we love, and add some variety. I originally wanted to have all the quintessential ingredients in a single dish, but I felt like that prevented the flavors of each individual component from expressing themselves fully. So I’m planning to make two terrines. This first terrine contains only tomatoes and peppers — never mind that neither of them is a vegetable, technically speaking! Thanks to the magic of agar agar (which can be purchased here), you can either serve it cold, or warm it in a 200 F oven. It goes great with my lyulya-kebabs or shashlyk Five Fingers! This recipe closes my trilogy of “Lake Sevan’s Gifts” (see here and here for the first two parts). Common whitefish, locally called sig, was introduced into Lake Sevan from Lake Ladoga, and has since become the prominent species as far as food goes. Goldfish were also introduced, which is a rather curious choice. Fish are typically introduced for human consumption and / or recreational purposes, and goldfish don’t seem to fit either of those criteria! 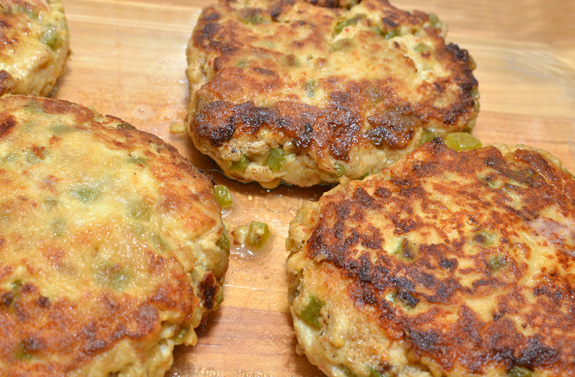 Although I don’t remember seeing fishcakes in Armenia (kebabs often being our only option during the whole trip), Armenian cookbooks do mention somewhat similar dishes, such as fish balls. If that’s more to your liking, you can certainly prepare the whitefish mixture as below and shape it into balls; coat the balls with either Wondra flour or breadcrumbs, and deep-fry them until golden-brown. The tomato and onion salad provides a simple accompaniment, the kind that’s often served everywhere in the Caucasus. I encourage you to get the best heirloom tomatoes you can find. This dish is inspired by a recipe from John Besh’s My New Orleans, a book that mysteriously arrived on my doorstep without me even ordering it. I was immediately seduced because it combined typical Caucasian ingredients — watermelon, tomatoes, cheese and herbs — in an unusual fashion. 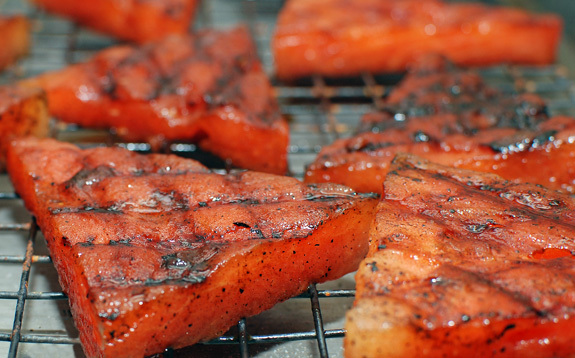 Indeed I must say I’d never tried or thought of grilling watermelon before! 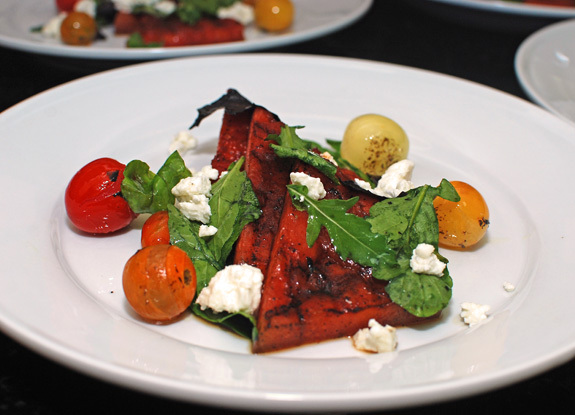 My main contribution was to focus on slightly fewer flavors and reinforce the presence of products from the region: goat cheese was replaced with brynza, pepper jelly vinaigrette and balsamic vinegar with honey. This is a great summertime dish, and if you happen to make your own white wine, this would be great to eat with it! Remove the rind of the watermelon, and cut into 12 triangles, about 3/4″ thick. Mix the olive oil and honey, and brush on both sides of the triangles. Let rest for 10 minutes. Season the watermelon with a little bit of salt, and cook on a hot grill just until you see hatch-mark patterns on both sides. Remove from the heat and reserve. Lightly char the cherry tomatoes with a blowtorch, then toss in a bowl with salt, pepper, and a little bit of olive oil. 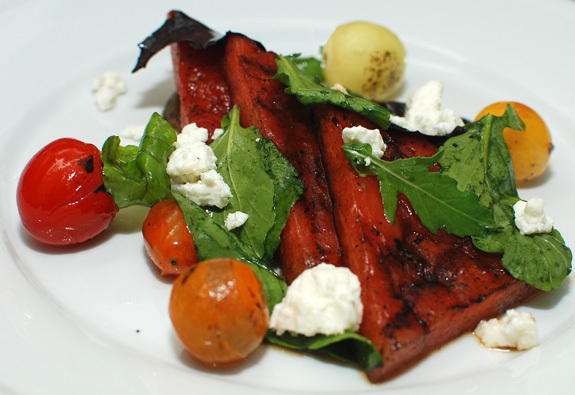 On each plate, place 3 triangles of watermelon, surrounded by 6 cherry tomatoes. Toss the rocket and purple basil with salt and a little bit of olive oil and arrange on the plates, then crumble the brynza on top. Serve immediately.